The trick to doing a 10 minute renal PTAS is all in the planning and visualization. Firstly, the CTA with 3D reconstruction (TeraRecon) gives excellent diagnostic images for arteries above 2mm in diameter and therefore obviates the need for additional diagnostic imaging if obtained before the planned intervention. The arteriography for the intervention then is focused on confirming the pathologic findings of the CTA. This patient has had prior lower extremity revascularization and has been troubled by difficult to control hypertension (4 meds) and mild renal insufficiency. Renal duplex found elevated velocities consistent with a >60% stenosis of his right renal artery. 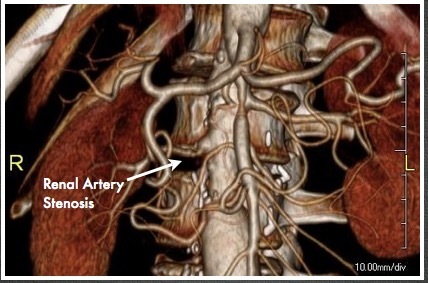 CTA revealed this, but also demonstrated a wealth of information regarding his aorta, his aorto-bifemoral graft, an asymptomatic SMA stenosis. So my initial plan was given his hypertension was to perform a focused renal arteriogram and intervention with minimal time and contrast. The first thing I did was go to TeraRecon and plan out access and camera angles. The CTA can show troublesome plaque, tortuosity, or lesions that could spell trouble for access. I decided to access the right hood of his aorto-bifemoral bypass graft above the anastomosis of his fem-pop bypass. Scar tissue, which can be problematic for sheath entry, can aid in excellent hemostasis. The camera angles and location of the renal arteries were determined with TeraRecon. I angled the view to see the right renal artery (above) at a orthogonal plane to my perspective -this turned out to be 20 degrees (see below). Without TeraRecon, this is possible with axial views by creating a clockface and generating an “o’clock” with each hour being about 30 degrees (see above). The origin of the right renal artery is about 9:30 by this scheme. This give me the camera angle to find the renal without shooting an aortogram solely for the purpose of locating the renal artery. 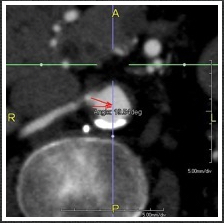 We already have an aortogram in the form of a CTA. The 3D reconstruction also informs us that the renal artery comes off at the base of the L2 spinal body at about 15 degrees LAO. This processed image from TeraRecon shows the skeletal landmarks where the origin of the RRA would be. The LIMA catheter is drawn on. I performed ultrasound guided access of the right femoral graft limb. Ultrasound allowed me to avoid the fem-pop graft. A micropuncture kit uses a small guage needle which is allows for repuncture. The sheath that comes with this comes with a stiff variant which goes through scar tissue well. I place a 6F sheath and send a wire into the aorta over which I send a 6F LIMA guiding catheter. This is actually a “cardiology style” of access, and the way coronary arteries are accessed. The guide catheters do need to be set up with Touhy-Borst connectors and 3 way stopcocks. With the camera properly pre-angled, when the LIMA catheter comes in full profile, it should aim the tip at the angle of the takeoff of the renal artery. Using a 0.14 wire (Spartacor) in my case, I start probing with the wire tip at the base of L2 -another important piece of preplanning data. Usually, access to the renal artery is very straightforward at this point. The Spartacor wire has the backbone to support passage of stents and balloons. I use a 145cm length wire, and stents mounted on rapid exchange catheters. 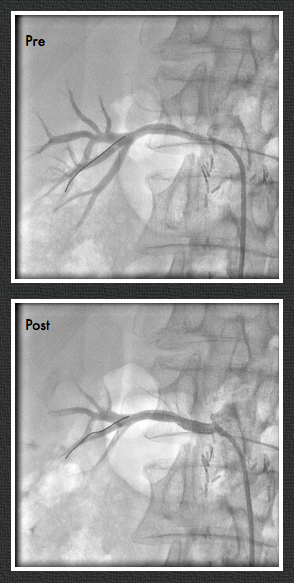 Renal arteriography is done through the LIMA catheter with hand injection, and intervention is very straightforward. 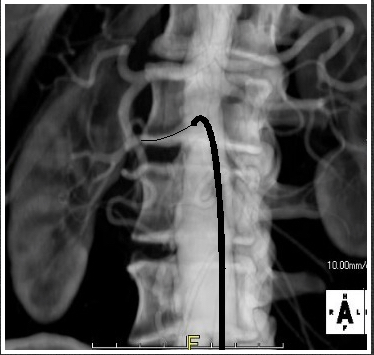 The predeployment arteriogram shows the renal orifice to be smaller than the 6F LIMA guide catheter. After stenting, the artery no longer has a stricture at the origin. The rapid exchange systems allow for quick catheter exchanges. Wires and catheters are removed. Total procedure times 10-15 minutes, and total contrast volume 10-20mL of contrast. This camera prepositioning, catheter profiling, spinal body aiming technique also works well in EVAR if you don’t have the 3D mapping package. Extra arteriography in localizing the renal orifices can often be avoided.